"Green tea leaves come from the same plant as traditional black tea, but are quickly dried to preserve their vibrant color and natural green tea antioxidants. We've blended our authentic green tea with delicate Bai Mu Dan white tea — one of the rarest and youngest of teas — to create a smooth, balanced cup with a pleasantly mild flavor." For smooth green tea with a mild, delicate flavor, always start with water that is very hot but not boiling. Pour very hot water (just at the brink of boiling) over one tea bag. Steep 2 minutes and remove tea bag. Sweeten if desired. Pour 2 cups very hot water (just at the brink of boiling) over four tea bags in a heat-resistant container. Steep 2 minutes and remove tea bags. If desired, add sweetener while tea is hot. Add 2 cups cold water and chill. Green tea and white tea. 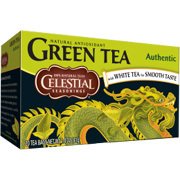 Decaffeinated Authentic Green Tea - 20 bags is shipped in a discrete, unmarked package. Orders are processed immediately and usually takes about 3 to 5 working days to be received. We do ask that you try it for 2 to 3 weeks to feel the full effects. Any information received is used only for order processing and shipping purposes. Your information, such as e-mail address, will never be disclosed to a third party.